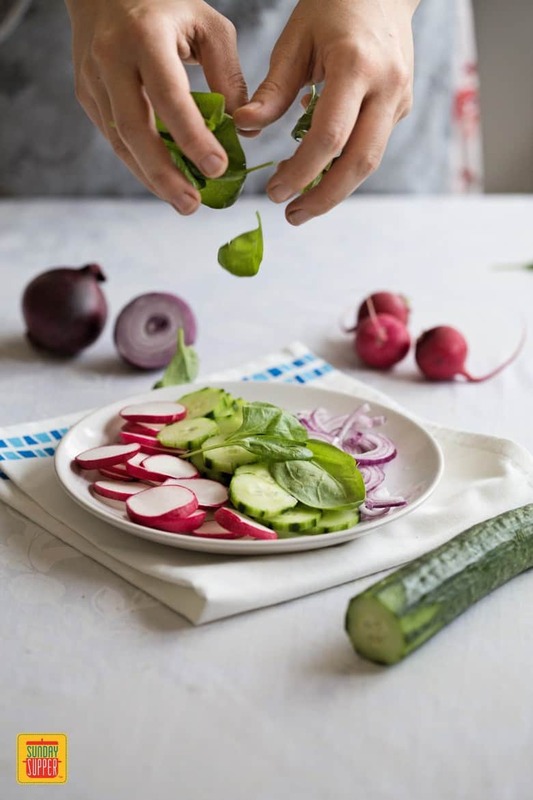 The PERFECT fresh Vegetable Salad you’ll want to eat all summer long! 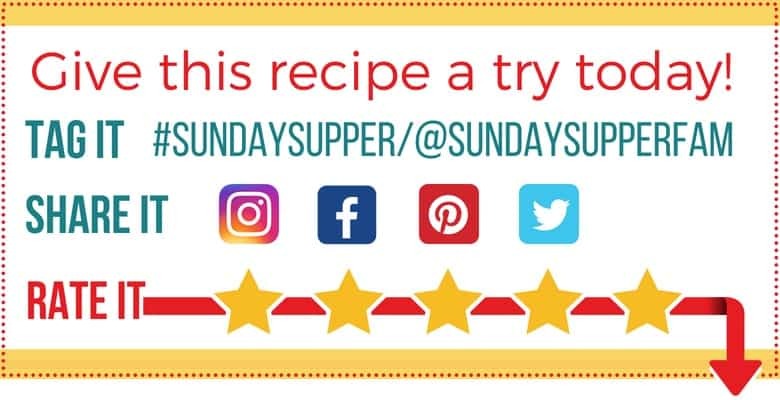 Quick & easy to make for lunch, dinner, and your summer potluck parties! In the summer quite often a nice vegetable salad can become the most satisfying meal for lunch or dinner. Salads are also wonderful as a side dish at potlucks. 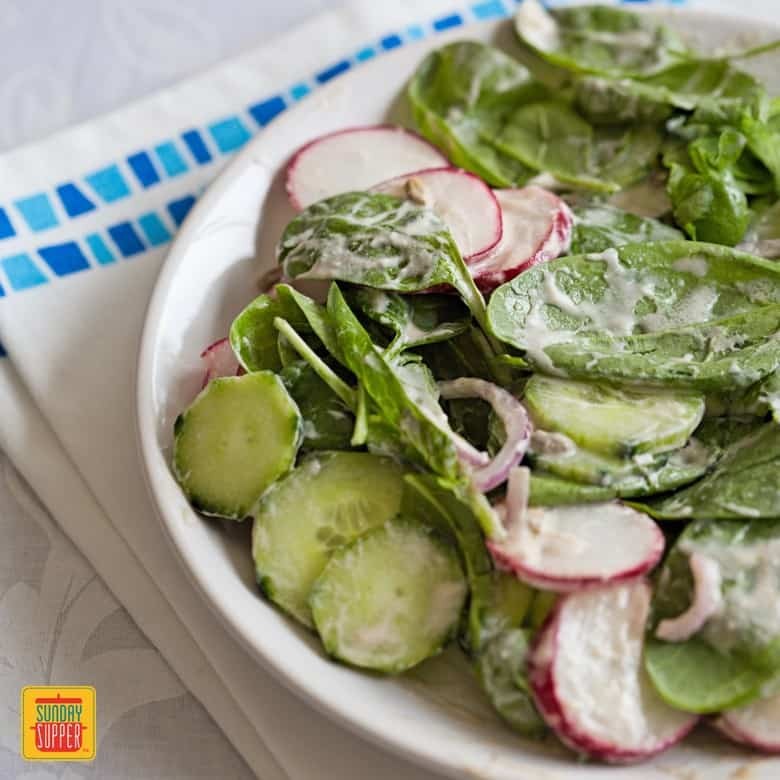 This Fresh Vegetable Salad with Creamy Balsamic Dressing is really easy and will give you a load of healthy nutrients. It is made of basic ingredients that are available in every supermarket. Last but not least, it is also very delicious! Normally when you think of preparing food for a potluck you consider recipes that are tasty, easy to make and easy to transport. A vegetable salad is a great option for summer potlucks as it is a much preferred side dish than other heavier food. It pairs perfectly with different kinds of meat or with vegetarian main courses. This Fresh Vegetable Salad with Creamy Balsamic Dressing is one of the easiest salads to make and yet very tasty! It contains only natural ingredients: crunchy vegetables and healthy dressing. 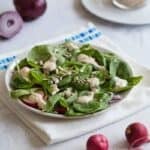 It is lighter than many other creamy salads as the dressing is based on yogurt and extra virgin olive oil so it doesn’t contain unhealthy fats. The sunflower seeds, on the other hand, compliment very well the vegetables with their wonderful taste. They are an additional source of healthy oils and fibers. 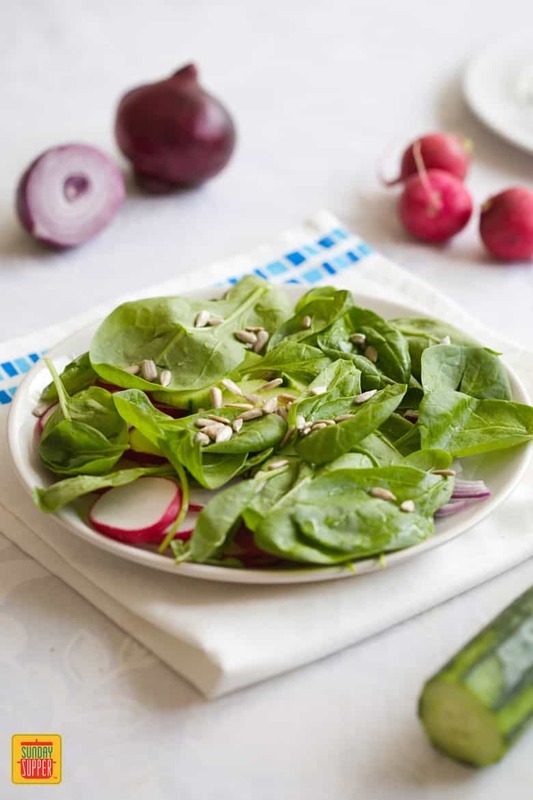 You might not have expected that sunflower seeds could go so well together with fresh spinach and cucumbers but it is a fact! It is incredibly easy to prepare this Fresh Vegetable Salad with Creamy Balsamic Dressing. 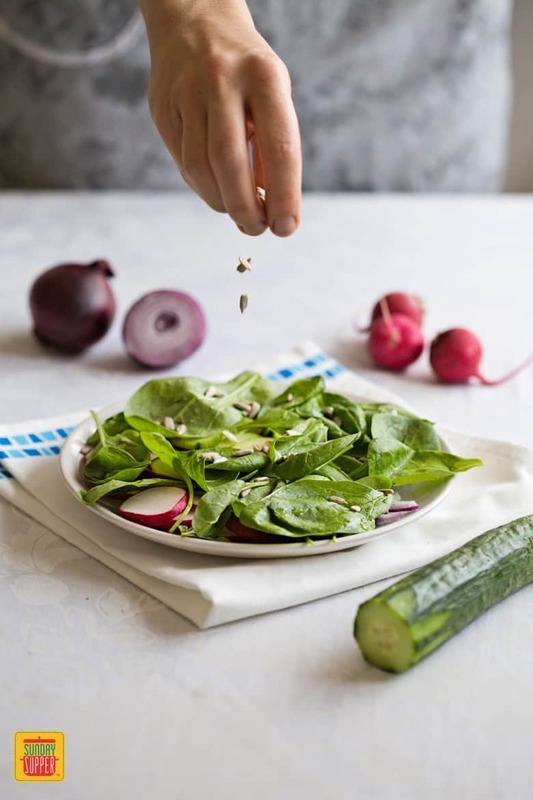 NOTE: In case you plan to bring the salad to a potluck, put the prepared vegetables and seeds in a large closed container and the dressing in another smaller container. Mix them together only before serving. That way you will ensure that the salad would be fresh when it comes the time to be served. For a beautiful and nutritious summer salad try this crunchy Fresh Vegetable Salad with Creamy Balsamic Dressing. No matter if you are planning to bring it to a potluck as a side dish or to serve it on a family dinner, you can never go wrong with this easy salad recipe! The PERFECT Fresh Vegetable Salad you'll want to eat all summer long! Quick & easy to make for lunch, dinner, and take to all your summer potluck parties! In a salad bowl combine all salad ingredients. 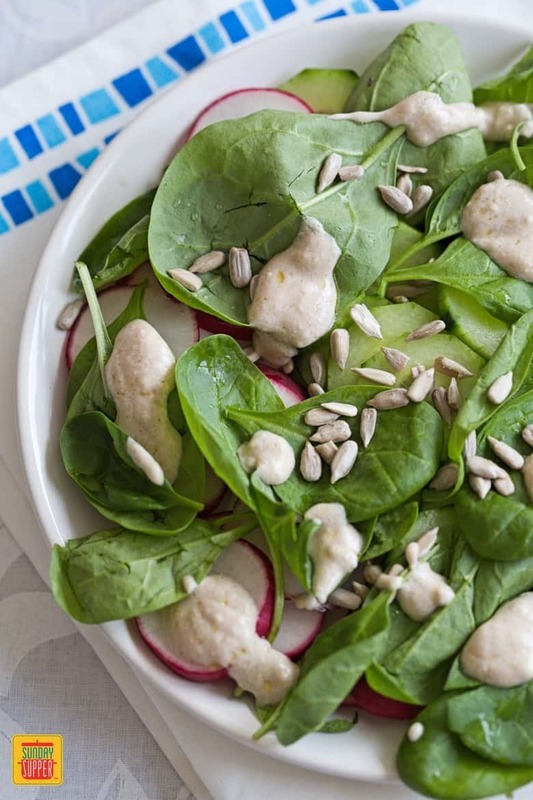 In a medium bowl whisk together all the dressing ingredients. 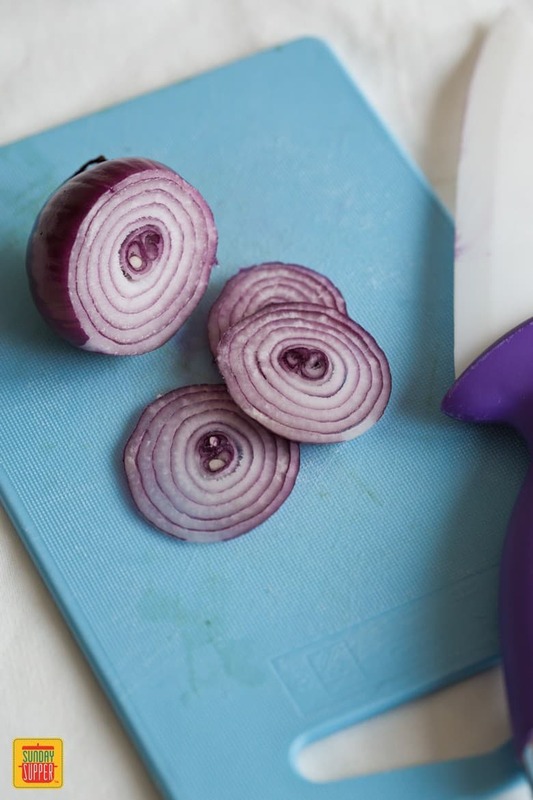 Taste and adjust accordingly with additional vinegar, oil or salt, if required. Before serving spoon the dressing on top of the salad and mix well.